No more rummaging through old book piles or shelves for particular items. No more hassles in the returns room sorting out a massive number of books one by one. No more being tied to the desk keeping librarians on hand to handle check-in/check-out items for borrowers. Today, many librarians have been freed up from time-consuming repetitive workloads because an increasing number of libraries that are leveraging cutting-edge technology to smarten up their loans/returns processes and collection management. Now, library staff will have more time and autonomy to devote themselves to higher value library services for their patrons. This customer is a supplier of RFID-based automation products for libraries, who is based in the Asia-Pacific region with world-wide operations. Their wide array of library products contains a self-loan station, which is a kiosk apparatus integrating a borrower card or identity certificate reader, a payment system, a receipt printer, as well as a touch screen monitor providing simple steps for patrons to borrow/return library items, including books, DVDs, magazines and other materials. Each kiosk is connected to the library management system via an IoT network, so that local check-in/check-out records can keep synchronized with the centralized database, and inter-library loans can be implemented and reservation services can be offered. With this payment system, the borrower submits a security deposit to allow their personal ID card or any other chip-based identity certificate to be used as a borrower card. Self-loan kiosks can be connected to other automatic equipment in the library such as smart bins, automated sorters, conveyors and/or automated shelves, so that the items each patron wants to borrow can be immediately located and sent to the pick-up points, and returns can be instantly checked in, sorted, re-shelved or placed in a holding area without human intervention. In addition to identity certificate/borrower card readers, payment system, slip printer and a touch screen monitor, the customer also wanted the self-service kiosk to be integrated with a digital camera to provide video surveillance. Furthermore, as the library might deploy other automation products in the future, the computer embedded in the kiosk should provide multiple I/O support to connect all interior components as well as exterior equipment in a highly integrated manner. Versatile I/O functionality requirements usually run contrary to the need for small sized embedded computers with aesthetic looks and appeal but Advantech solved all these seemingly contradictory requirements with their exclusive fanless computer offering. Advantech’s ARK-1124U is a fanless palm-sized embedded computer providing multiple I/O support within a highly compact mechanical design and an optional dual layer ARK-Plus module and iDoor I/O expansion module. ARK-1124U provides support for a full-sized miniPCIe slot with a SIM holder which can be used to enable WIFI/3G/LTE wireless communications, multiple serial communication ports, as well as USB ports for connecting with other components inside the kiosk installations. Furthermore, the ARK computer can be optionally combined with a second layer of ARK-Plus to expand storage and I/O capabilities and/ or an iDoor I/O expansion module, so that this mini-sized computer can support connection with a greater number of devices and cater for future application needs. 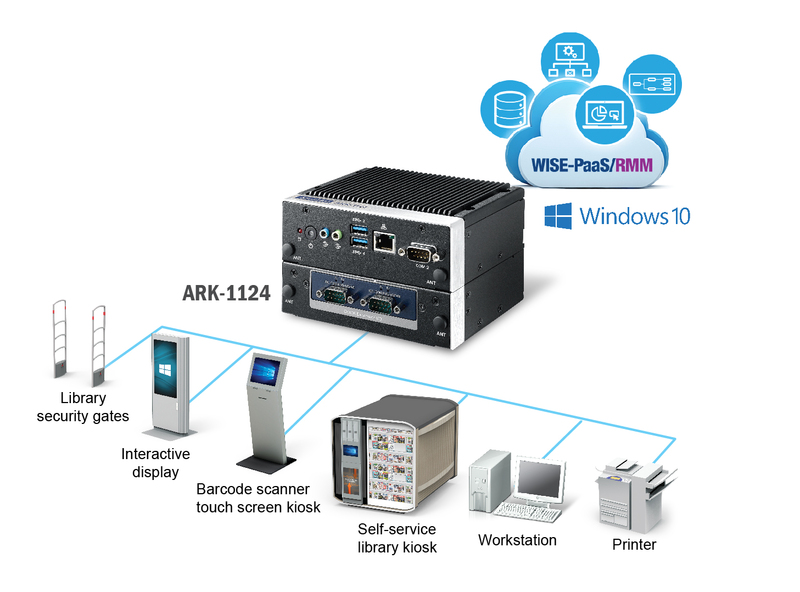 In terms of software support, ARK-1124U is preinstalled with Advantech’s IoT device management platform WISE-PaaS/RMM, which provides support for most communication protocols so that the system can easily connect with the customer’s other library automation products or other 3rd party products in an integrated IoT network, providing remote monitoring functions such as remote system diagnosis and library management, as well as cloud applications such as inter-library data exchanges or reservation services. The software suite contains a very easy-to-use dashboard development tool for the system integrator to design customized dashboards for data display and remote monitoring needs. The system also supports Windows 10, providing convenient options for Microsoft IoT development and management services to integrate and orchestrate a large number of device types with greater ease. ．Library automation and intelligent functions to reduce manual workloads and provide convenience to patrons with a simplified and efficient loans/returns processes. Advantech’s brand-new designed IoT device operations and management App solution gives users a transformational plug-and-play experience with easily utilizing onboard devices, efficiently monitoring device health status, and securely sending software and firmware updates over-the-air (OTA) on-site and remotely at scale. For AIoT applications in extreme environments, NVMe SSD is the ideal storage option because of its high performance and capacity. 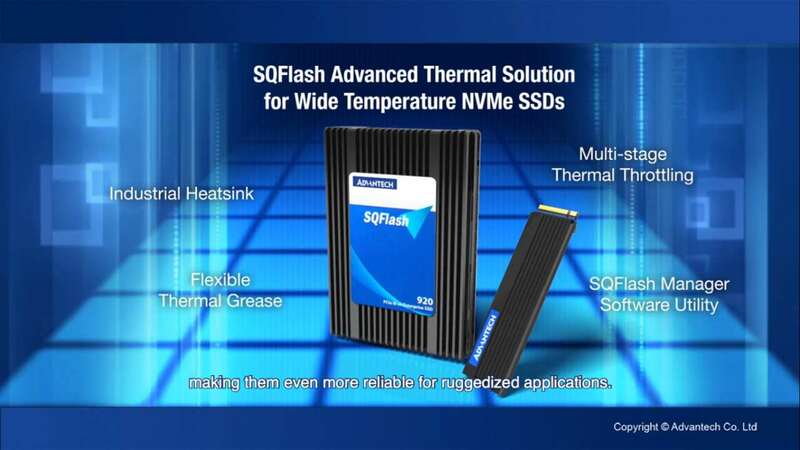 Advantech’s SQFlash NVMe series products are designed with our market leading thermal solution, making them even more reliable for ruggedized applications. 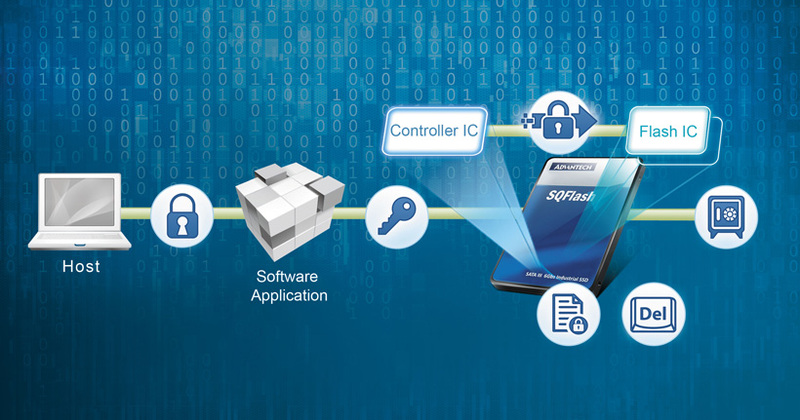 Advantech SQFlash has developed many features for data security software on storage devices such as Write Protect, Security ID, Flash Vault, Flash lock, and Quick Erase. These functions can be set through hardware configuration or software settings with a user-friendly interface for data security enhancement. Advantech SQFlash Half-size mSATA combines the advantages of flash disk technology with the Serial ATA III interface, which electrically complies with the Serial ATA International Organization Standard. Half-size mSATA, consisting of a Half-size Mini PCIe form factor with SATA signal pins comes with a wide range of capacities from 1GB to 64GB for SLC and 4GB to up to 128GB for MLC which delivers the read / write performance up to 250MB/s and 150MB/s.